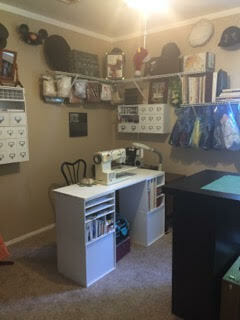 It has been a very long road, but I finally have a dedicated sewing room that I am happy with! 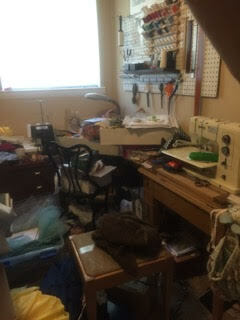 When Brian the Engineer and I moved into our first house, I had a sewing room for the first time in my life. 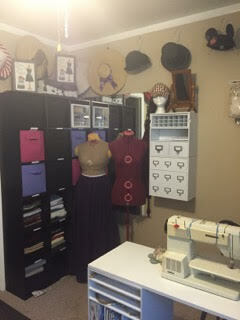 But I never got it organized the way it needed to be so that it actually functioned as a sewing room. 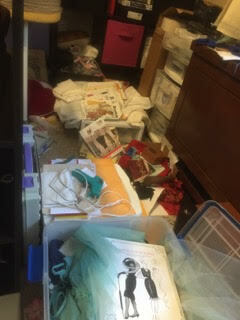 It was really just a room with all of my sewing supplies, fabric, finished and half-finished costumes stuffed inside. Most notably, I had no cutting table, which was fine because I could use the dining room table. Fast forward a year, and we were considering buying the house instead of continuing to rent it, but that deal fell through and we decided to buy a smaller but nicer house a block down the street. It was an excellent decision all around (the new house has a dishwasher! 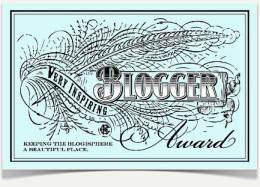 - which the previous one lacked) and we have been very happy here. I once again crammed all of my sewing accoutrements into the designated bedroom, and attempted to organize it. This room has two unique features: a built-in corner desk under the window, and a large mirror mounted on the wall. However, the new house lacked the spacious dining room space of the previous house, and we had bought the dining room table and chairs specifically to fit into that dining room. So the dining table, sans one leaf, became the kitchen table. But the kitchen is small, so it has to be pushed against the wall to make the best use out of the floor space. Therefore it is less useful as a cutting table as it had once been. You'll notice that all of my furniture is pushed back against the walls. I thought at the time that this was the best way to make use of the space. There's also a lovely layer of flotsam and jetsam around the edges of everything. I never seemed able to purge that. But we'll come back to that. On with the table assembly! Hard to believe it could all fit in this box! It was heavy. I actually really enjoy this sort of thing. Just under an hour later, I had the two support sections put together, and Brian came and lifted the top while I positioned them correctly for final assembly. You can see the shelving that Brian the Engineer installed for me, as well as the display/storage system I came up with for my hats. Nina worked with me for two days, during which we took absolutely everything out of the room, and bulk-sorted it into three categories of Keep, Throw, and Donate. At the same time, her assistant emptied out our storage shed in the backyard. 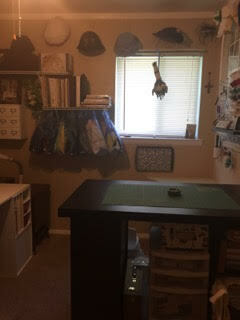 Nina then removed the door to the closet, returned the furniture to the sewing room in a new configuration, and helped me sort all of the Keep items into smaller categories so that we could find places to put everything. Much of my fabric stash (which was already sorted into plastic storage bins and drawers) got put into the storage shed on shelving units from Nina's stash of used furniture/storage items. This left much more room to work with in the sewing room. We also replaced my old sewing machine table with a new one which we built from modular storage cubes from Michael's. Nina placed the new sewing desk in the corner farthest from the door, but set it up in an L shape with my cedar chest (holding the serger and lamp) so that when I'm seated behind it I'm facing the door. She also placed the cutting table against the opposite wall, rather than in the middle of the room. I can still get around three sides of it, and the cubbies are at the open end. So much better! I still had more sorting to do, but the bulk of what I needed help with was over. I was incredibly impressed with how quickly we got the work done, and how much space Nina found in such a small room! One of Nina's innovations that I really liked is the use of the black cubby shelves that I already had. Her idea was to use the open cubbies to store large cuts of various material in a decorative way, folded and stacked and sorted by fiber content. Then the bins are used for scraps, also sorted by fiber content. She used her label maker to create designations for each. I really love the new setup of my room! I've done some tweaking recently, though. I was finding that (over the past six months) I was often needing to go fetch various items from the backyard shed to work on projects. 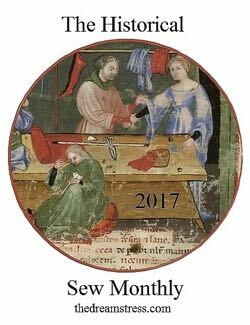 It soon became clear that much of what was in the shed actually needs to stay inside, so after a while the sewing room became cluttered again. 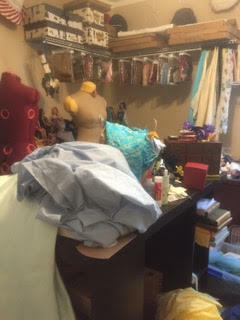 A month ago, there were bags of fabric all over the floor, and once again the cutting table had become a large shelf. Something had to be done. The laundry bags are what I used to bring them in from the car - I managed it in one trip! They fit very nicely into the space below one of the wall units Nina had installed for me. Next I rearranged the closet, since it had largely become dead space. We had hung all of my completed costumes in there, which was certainly a better solution than hanging them on the rolling garment rack I had previously been using. However, this proved to be less than ideal in the long run. 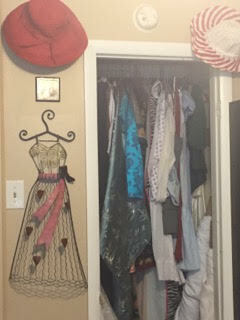 The bar of the closet is too high for me to reach easily, so it was rather difficult to get my garments in and out. 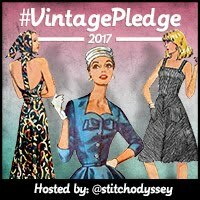 I therefore moved most of them to an underutilized closet in a different room, keeping only the shorter items like tops, waistcoats, and jackets in the sewing room. 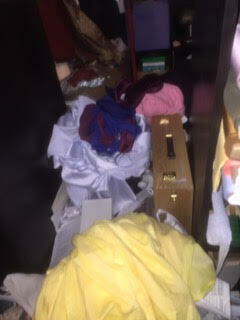 Then I removed a lot of clutter from the floor of the closet, and brought back the drawers holding fabric from the shed. On top of the drawers is my mending basket, commonly mistaken for a cat bed. Since there aren't many garments hanging in this closet anymore, this fills the dead space above the drawers nicely. These boxes are great for keeping all of the fabric, notions, and patterns for the projects I'm currently working on together and tidy. They are exactly the width of the space under the table, so I can remove one of my comic book boxes without worrying about them falling down. Although now I'm considering moving the thread over to my sewing machine - when I installed the pegboard that's where the machine was. My dad made the stained glass rose for me. I recently bought a comfy swivel chair to replace the uncomfortable metal chair I'd been using. But my cutting table is no longer used for overflow storage! And I can use my ironing board in the sewing room, finally! It had been set up in the living room for months, much to Brian's chagrin. Fabric manipulation - cleaning, pressing, stiffening, etc.